Our custom designed boxes are made from strong, double wall Kraft Corrugated Board, approx. 7mm thick. We use high grade polythene fish bags and optimum oxygen is added to ensure your fish arrive in a perfect healthy condition. In warmer temperatures, ice packs are added to the boxes to keep the water cool. Once we have agreed a delivery date and time, your fish will be packed 1 hour before our specialist appointed courier arrives. Home delivery is available from 1st April to 30th September and our delivery days are, Tuesday, Wednesday, Thursday, Friday and Saturday*. So, if you order before 12pm we can arrange a next day delivery on one of the above days. (Orders placed on a Saturday or Sunday, will be delivered on the following Tuesday). Your order will be sent overnight with a guaranteed delivery before 12.00pm. * Delivery is free on orders over £50.00, with the exception of a Saturday delivery, where there is a charge of £19.99 on orders under £150.00 and £25.00 on orders under £50.00. Unfortunately we do not deliver to Ireland, Channel Islands, Isle of Mann, Remote parts of Scotland, Europe or Internationally. Boddington Koi are proud members of the PKDA (Professional Koi Dealers Association) and we therefore follow the PKDA protocols for both quarantining and sales of our Japanese Koi Carp. It is our responsibility to ensure that all purchasers have sufficient information on the specific requirements of the fish species they wish to purchase, in order to provide the fish with adequate care. The purchaser must have an understanding of pond filtration and how vital water parameters are to fish welfare. In addition the new owner should have an awareness of the dietary requirements of the fish, how the seasons bring about changes in their needs and to recognise the common health problems. Boddington Koi therefore, offers full, before and after sales support, to all our customers. 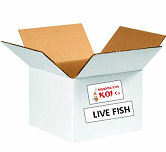 Every box of fish will include a 'Fish Care and Introduction' leaflet. 1. Any claim for damage as a result of the courier must be documented and the courier’s delivery note must be clearly marked. 2. Your claim must be reported at the time of delivery, by telephone (01905 757800) and supported with a photograph, emailed to sales@boddingtonkoi.com . 3. If the delivery note is not signed to indicate the damage, or the claim is not reported, as above, we cannot accept liability. 4. The Fish must be retained (frozen if dead) until such time as a credit has been agreed. 5. If the fish should die, as a result of poor health, or show signs of poor health, within 24 hours of its arrival, your claim must be reported within this 24 hour period, by telephone (01905 757800) and supported with a photograph, emailed to sales@boddingtonkoi.com . 6. After the 24 hour guarantee period has lapsed, should the fish show signs of ill health, we will continue to provide a full advisory service to establish the cause of the ill health and give our recommendations for the treatment and recovery process. 7. Whilst we will always endeavour to deliver fish in first class condition we recommend, if possible, that you quarantine all new fish and only introduce to existing stocks once you are satisfied with the health of your new fish.